I posted about how Mr. Newlywed Giggles was not feeling so well this past week. Well, while he was home resting, I ran out to go to the food store to pick up some Ginger Ale, saltine crackers, and some chicken noodle soup. As I am in the soup aisle picking up the original Campbell's chicken soup, I see a can of the character soups. I decide that it would be funny and cute to pick up a can of the Shrek soup and figured Mr. Newlywed Giggles would get a smile out of it. He did. 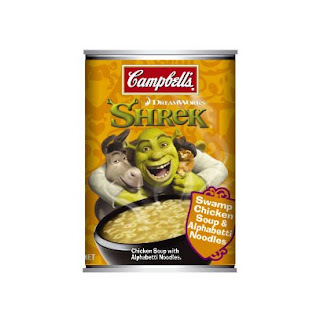 Mr. Newlywed Giggles yells out to me:: "Babe, can you pick up some of the Shrek chicken soup for me"
Mrs. Newlywed Giggles:: "But we have other cans of chicken soup." Mr. Newlywed Giggle:: "But the Shrek soup tastes better." This is when I laugh and leave. I bought him a can of Shrek soup too. Typical man :) My husband insists various brands of chicken noodle soups taste different too - I don't taste it, but whatever.